Necrophobic have circumvented the law of diminishing returns better than many worthies of the past; ever a band in touch with the lineage of classic heavy metal, Necrophobic somehow managed to subsume their intensely melodic and syncopation-heavy writing style into a theatrically progressive narrative not dissimilar from contemporaries Unanimated, Dawn, and Sacramentum. It is a thematic tightrope that the band has walked with great skill; while the riffs have come to predominantly represent the cyclical nature of speed metal since 01’s Blood Hymns, the band preserve the undeniable dark mood and energy of their heyday. It is some feat, considering the melodic landscape they occupy, a balance that has occasionally eluded many a band: it seems a rule of thumb, especially in extreme metal, that utilizing greater harmonic space is but a precursor to ill-advised detours, but Necrophobic‘s musical and emotional maturity has steadfastly given the lie to this formulation. 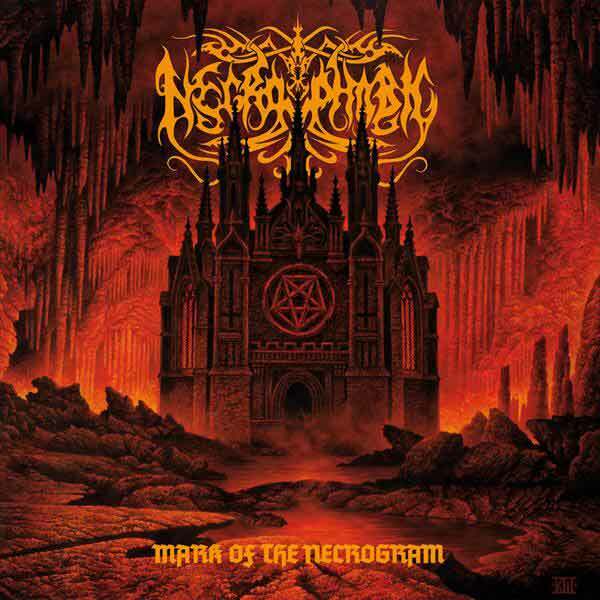 It is hard to think of a modern album that has oozed more metal from its marrow than Mark Of The Necrogram. Virtually every technique worth studying and imitating on the consonant end of metal songwriting is documented here; that in turn directly implies that there are things like repeating motifs, bookends and breaks for lead guitar to be found here aplenty, all of which far from being indulgence actually grant these songs genuine identity, an endangered commodity in modern metal music. Where a band like Dissection kept simplifying a kindred template to the point of the Youthanasia-like Reinkaos, Necrophobic remain a fundamentally ambitious band. Ideas lurch forward, then are interrupted by lateral fissures opening upon the face of composition, only to be eventually recapitulated. The strength of this band’s work has been in keeping individual minor-key phrases short, sharply-defined, and ending on points of tension, and the use of subtle dissonance as a flavoring agent to accentuate that tension. The latter is no longer as pronounced as it was on The Nocturnal Silence, still the band’s pinnacle, but neither is Mark Of The Necrogram the sound of a band short of inspiration and going quietly into the night. This entry was posted in Black Metal, Death Metal and tagged Black death, mark of the necrogram, Necrophobic, sweden. Bookmark the permalink.